Apple updated their App Store Distribution page yesterday to note 56% of devices are now running iOS 8, based on App Store usage as of November 10, 2014. This is a 4 percent increase from the 52% adoption rate numbers released two weeks ago; iOS 7 has dipped slightly to 40% (the total adds up to 101%?). 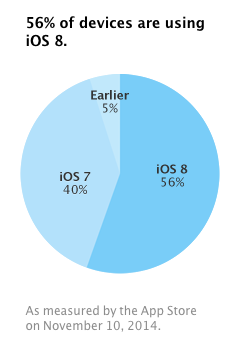 There are a variety of reasons the pace of iOS 8 adoption was slow out of the gates and has just now started to turn the tide. Users were initially hesitant to upgrade due to a critical bug in the botched iOS 8.0.1 update. Meanwhile, the over-the-air upgrade also requires 5GB of free space, something I can’t imagine those with 16GB models can come up with easily. However, with iOS 8.1 bringing support for Apple Pay plus Continuity features like Handoff and SMS Forwarding, expect more people to make the plunge. Just over a week ago iOS 8.1.1 beta was seeded to developers, so expect that release to come soon and fix even more bugs.